These carrot Easter buns are my take on the traditional hot cross bun but with a carrot cake twist. Really simple to make, these sticky buns are not only perfect for Easter but can be enjoyed pretty much all-year round. 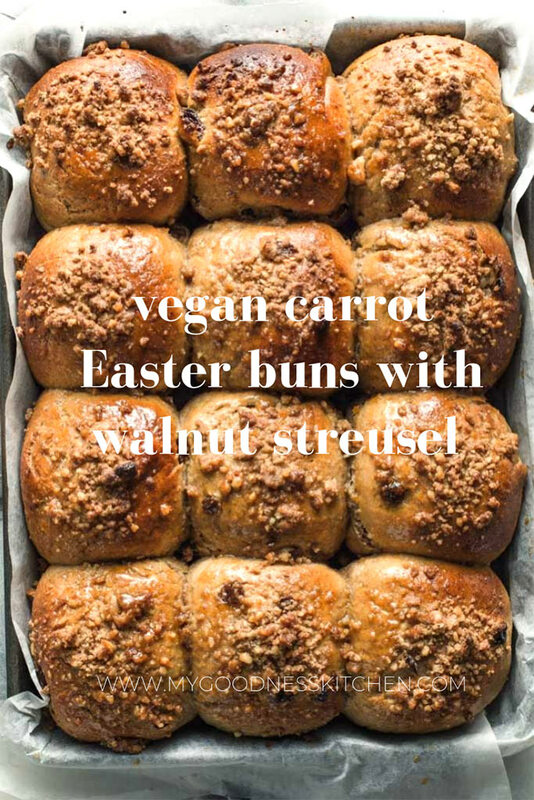 I am so excited to share this recipe for vegan carrot Easter buns with walnut streusel with you. If you’re anything like me, making your own hot cross or Easter buns has always seemed a little daunting and time consuming…besides, why invest the time baking when you could be eating all those chocolate eggs? I hear you. What’s more, the stores are teaming with hot crossed deliciousness at the moment so…why bother? We bother, my friend, because freshly baked sticky buns emerging from the oven in the morning is something not to be missed. And these little carrot Easter buns are vegan so everyone can enjoy them. 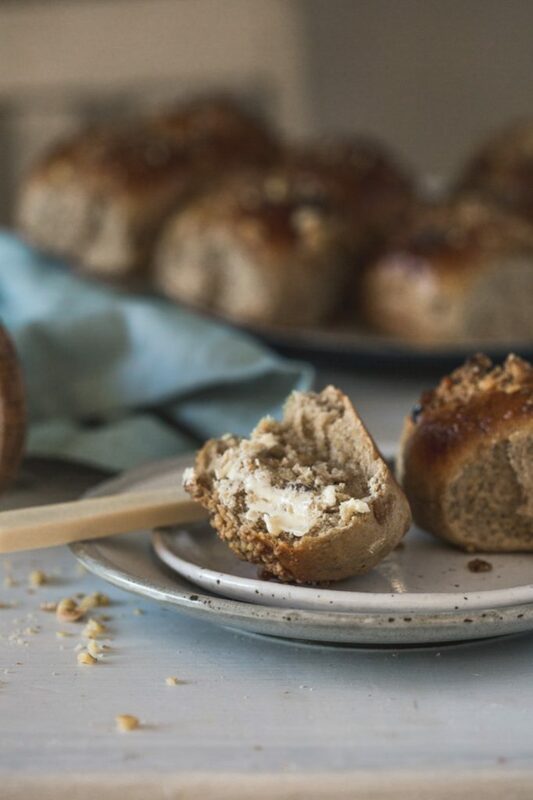 Most traditional Easter bun recipes, like Nagi’s gorgeous hot cross buns over at Recipe Tin Eats, contain both eggs and butter. Not these little guys; we are eggless and butter free opting instead for olive oil. I promise your family won’t notice the difference. These buns are soft, spiced and all things delicious…and, they’re pretty foolproof. 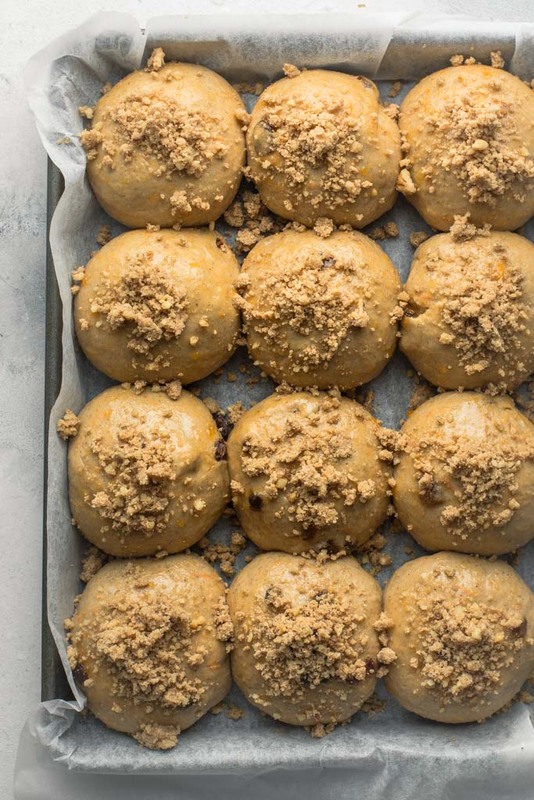 This simple recipe creates fluffy carrot Easter buns every time and it’s pretty darn simple. I am not what you would call a natural baker and I used to balk at the idea of using yeast. It just all seemed too prickly and prone to error. I was missing out though! Baking with yeast is simple and as long as you keep these yeast truths in mind, you’re golden. Use live or active yeast. Yeast can die or become inactive. Test your yeast by combining 2 teaspoons of yeast with 1/2 cup of lukewarm water and a 1/2 teaspoon of sugar. After 5-7 minutes, your mixture should have a thick foamy surface. If not, your yeast has met its maker and it’s time to buy a new batch. Only combine yeast with lukewarm liquid. Too hot and the yeast will die (that’s dramatic); too cold and it won’t activate. Luke warm simply means blood temperature. You know you have lukewarm water when you run it over your hand and you can’t feel it; the temperature is so close to your own. Nothing technical, just a feeling. If in doubt, lukewarm is around 36.5 to 40 degrees C (100 – 110 degrees F). If I can cook with yeast, anyone can. So…with all our yeast fears assuaged, tell me…are you ready to create a new tradition? 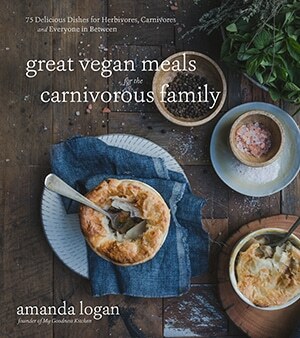 After buying hot cross buns for my family for so man years I am so excited to have a new, vegan version to share with them. 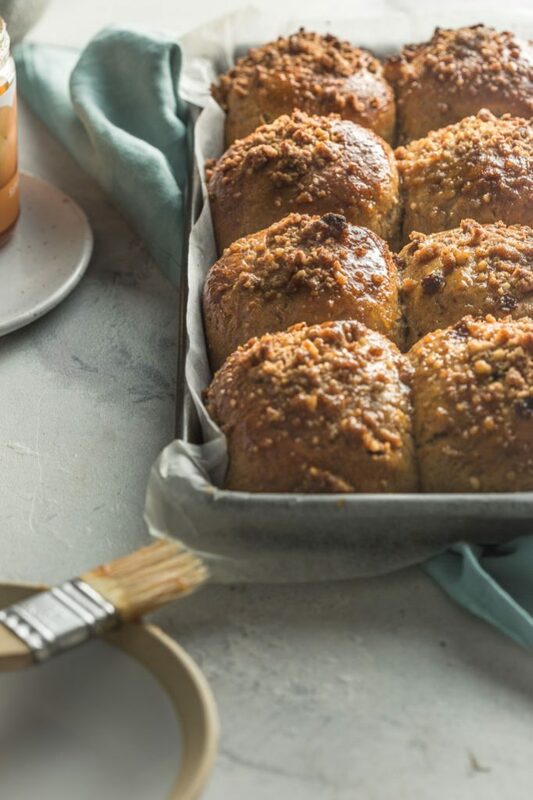 These carrot Easter buns are soft, fluffy and full of delicate spices. And the walnut streusel? 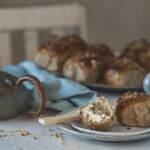 Well, it emerges from the oven all caramelised and sticky adding just a hint of sweet, nutty crunch to the bun. If Easter is a time of family and tradition, I can’t think of a better one to start. I, for one, am looking forward to siting down to breakfast with my tribe, the air still fragrant with sweet spices from freshly baked Easter buns, for many years to come. In a jug or bowl, combine the luke-warm water and milk with the yeast and set aside for 5 minutes or until the mixture is foamy. In a large mixing bowl, stir together the flours, sea salt, cinnamon, all-spice and sugar. When the yeast mixture is ready, add the oil and grated carrot and lightly stir before adding the mixture to the dry ingredients. Before combining also add the sultanas. Combine the ingredients with a spoon until it begins to come together and then continue with your hands working the dough until it comes together in a large mass. Lightly dust your counter top with flour and turn the dough out on to it. Knead the dough, adding a touch of flour at a time to reduce the stickiness (I usually end up adding up to 3 tablespoons more) for around 8 minutes or until the dough is soft and smooth. Line a slice pan with baking paper. To achieve similar size buns, weigh the dough and divide the weight by 12 to get an individual weight (it's usually around 100 grams each). Cut the dough and weigh each portion to get your correct weight before rolling each piece in to a ball and placing them on the baking tray with a small space between each ball. Cover the buns with a damp tea towel and set aside to proof for 1 and 1/2 hours. Meanwhile, place the walnuts in a food processor and pulse to a rough crumb. Transfer the crumb to a bowl and add the remaining streusel ingredients. Using your fingers, rub the mixture together to a wet but textured sand consistency. In a separate bowl, combine the apricot jam and water to create a glaze. Pre-heat the oven to 200 degrees C (390 degrees F). After an hour and a half, take the buns and brush each one with a good amount of the apricot glaze. 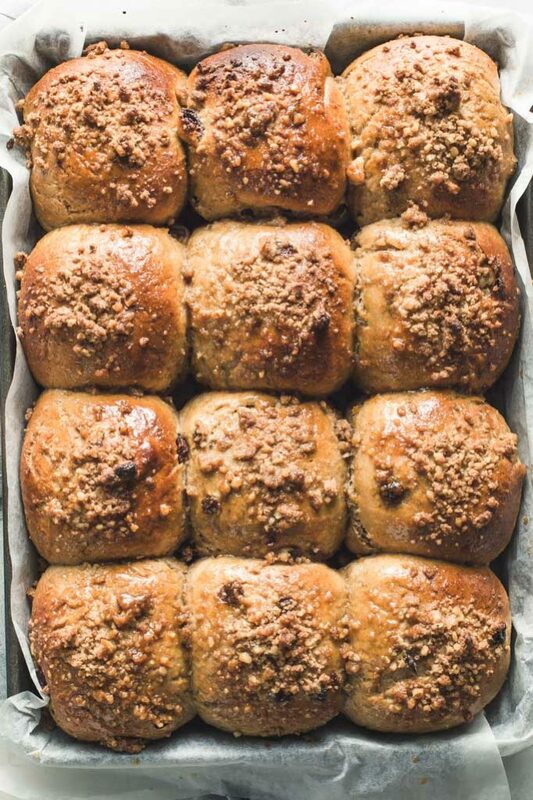 Follow with a good sprinkle of the walnut streusel on each bun and a small pinch of sea salt. Place the buns in the oven and bake for 25 minutes or until a deep golden. Remove from the oven and gently add more glaze to the buns before serving hot with vegan butter. To achieve lukewarm milk, I microwave the milk for 15 seconds. These Easter buns are delicious and I will be sharing them with the family over the long weekend! 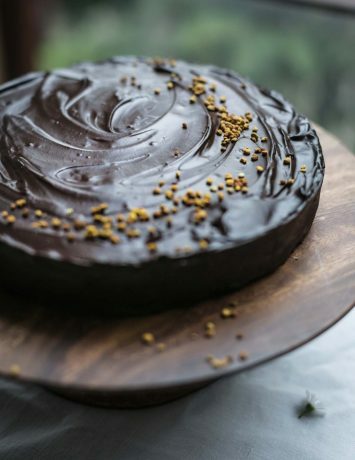 Thank you for such a gorgeous recipe! If I don’t have a microwave how do I make sure that the milk is at the right temperature?